Remember that big dance party scene in Zion from The Matrix Reloaded? Wouldn’t it have been better—much better, really—if it had been acted out by dozens of little smiley faces, lightning bolts, fruits, or international flags? 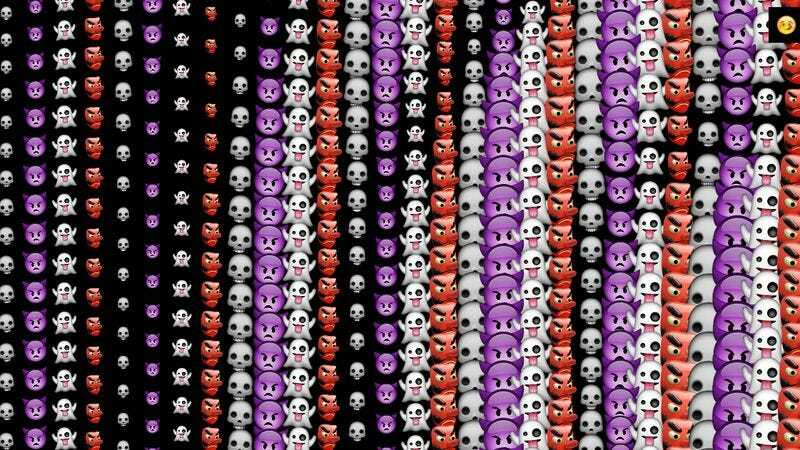 That is the thinking behind Emoji Party, a strangely addictive, endlessly customizable site that allows the user to hold sway over an ecstasy-fueled, all-emoji bacchanal, complete with a thudding, 126 BPM soundtrack. Those who are bound and determined not to do anything practical or productive today will be able to lose themselves in the ceaseless, limitless permutations of Emoji Party. These picayune pictographs never tire. They will keep dancing for as long as the viewer wishes. The visitor to Emoji Party will at first encounter merely a field of standard yellow smiley faces and just a bare-bones drum track. Never fear. All of this can be upgraded. The ersatz dancers, one soon discovers, follow the movement of the cursor from one corner of the screen to another. Clicking and holding on them upgrades the music. In the upper right corner, meanwhile, is a small black screen. Moving the cursor to it summons forth a vast menu of potential emojis for the Emoji Party. Like a bouncer at an exclusive club, the user can decide who’s in and who’s out. Want nothing but self-aware feces on the dance floor? Make it so. Viewing this site at length, one is perhaps reminded of the haunting penultimate scene from Cormac McCarthy’s Blood Meridian. And they are dancing, the board floor slamming under the jackboots and the fiddlers grinning hideously over their canted pieces. Towering over them all is the judge and he is naked and dancing, his small feet lively and quick and now in doubletime and bowing to the ladies, huge and pale and hairless, like an enormous infant. He never sleeps, he says. He says he will never die.